The Nichols Library is open Monday, Wednesday and Friday from 10am to 6pm and Tuesday, Thursday, and Saturday from 10am to 1pm. 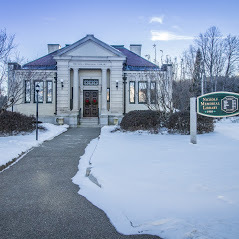 The Nichols Library is located at 35 Plymouth Street (the corner of Plymouth and Main) in Center Harbor, NH. Scroll past the embedded map for detaiked travel directions. From the North and East, follow Route 25 through Moultonboro and continue south for 5 miles to Center Harbor. At the junction of Rte 25 and 25 B, turn right on 25B. The Library is on the Town Square, opposite the Kona Fountain. From the South and I-93, take Exit 23, go 9 miles east on Rt. 104 toward Meredith to Route 3 (left at lights). Follow Rte. 3 North through Meredth (Lake Winnipesaukee will be on your right). Turn right at lights onto Rte. 25 East. Continue north for 5 miles to Center Harbor. At the junction of Rte 25 and 25B (traffic light), turn left on 25 B. The Library is on the Town Square, opposite the Kona Fountain. From the West, follow Route 25/3 east through Holderness for 4.8 miles to the junction with Route 25B (Dane Road). Turn left, and go 2.3 miles to Center Harbor. The Library is at the foot of the hill to the right of the Kona Fountain.